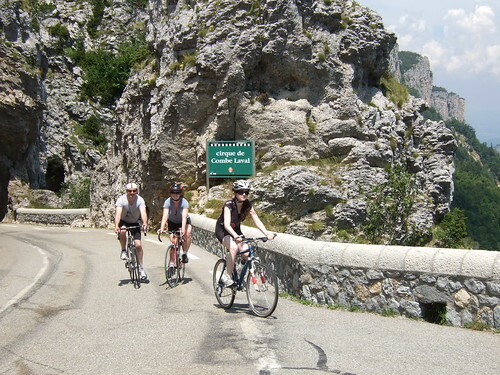 Teresa Harte has this guide to cycling in the Vercors in the Drome department of the Rhône-Alpes. The Vercors is one of France's hidden gems, with the Parc Naturel Regional du Vercors (in French) making it a paradise for cyclists. This range of mountains stretches from Valence in the east, Grenoble in the north and Die in the south, and spreads across two departments, the Drome and the Isere. The National Park status means the Vercors has a vast collection of natural wildlife, including wild boar (sanglier), stag (cerf), roe deer (chevreuil) and les chamois (small goats). There are over 140 bird species, including three kinds of falcons – familiar sights while cycling, even in the lower valley. Flora is also in abundance, with 28 rare or endangered species, including wild tulips, lady slipper orchids and edelweiss. More common flowers are narcissus, saxifrage and alpine gentian. The plateaux comes alive with wild crocus and other flowers in April when the snow recedes. In May, shepherds walk their sheep from the valleys to the high Vercors, following an old tradition called Le Transhumance – it's quite a sight to see thousands of sheep going up a mountain pass as you are descending. The landscape is spectacular, featuring limestone cliffs, vast forests, deep gorges, rivers, caves and beautiful, impressive roads – the most vertiginous in the world. It covers 6,561 square kilometres, has 22 cols (mountain climbs) with over 17,000km of ascents, with the highest point called ‘Grand Veymont’ reaching 2341m. The highest surfaced road reaches 1600m. Many of the cols (mountain passes) have featured in the Tour de France throughout the years, including the Col de Madeleine and the gruelling 21km switchback, Col du Rousett. The really wonderful thing about the Vercors is its tremendous choice of routes, ranging from 10km to 160km, all within a small area. The gradients are gentle, with lots of rest places and, unlike the high Alps, there's the option of continuing up another col or cutting the ride short, depending on how you feel on the day. From a base such as St-Jean-en-Royans, St-Nazaire-en-Royans or Pont-en-Royans at the foothills of the Vercors, there's the choice of heading straight up the Vercors, heading north-west for the rolling hills of the Drome, meandering along the matrix of secondary roads on the Isere Valley towards Romans-Sur-Isere, or choosing a route that combines all three. The Royans is a series of villages that make up the north-west of the Vercors, known for its cattle, cheese and walnuts. It's also home to three of the most impressive Vercors gorges: Combe Laval, Grand Goulets and the Gorge de Bourne. The roads are generally well surfaced with very low traffic levels even in the summer months. As it is popular area for cyclists, the majority of drivers are courteous, making sure to leave lots of space when they pass by. The area features some of France’s most important engineered roads, namely the Col de la Machine, a majestic road build over 100 years ago and cut into the side of the Combe Laval – Europe’s largest gorge and a national heritage site. Meanwhile the Petite and Grand Goulets, a series of tunnels cut into the mountain, is a stunning display of engineering ingenuity. Starting at Ste-Eulalie-en-Royans, the narrow road climbs up beside the deep gorge with the Vernaison river, towering cliffs and hairpin bends making it an exhilarating ride. Sadly, in 2009 the Grand Goulets higher up the mountain were deemed too dangerous and were closed to the public. An underground tunnel now runs more that 1km through the mountain instead, but there's talk of the old road being re-opened for pedestrians and cyclists. Historically, the Vercors are very important, with many of the hilltop villages strongholds for the Resistance during the World War Two. In the village of Vassieux on the plateaux in July 1944, more than 600 Resistance fighters and 200 civilians were massacred by the retreating Germans. A memorial museum, built into the hillside, pays homage to them and, further down the plateaux, is a cemetery; nearby are the remains of the glider planes that carried the Germans. It's a beautiful place with a tragic history that is still tangible today. The largest town further up the Vercors is La Chappelle-en-Vercors, which has markets twice a week and a couple of good options for café stops. It also has a lovely church and ancient monument. Dotted around are other villages such as St-Julien-en-Vercors (in French) and St-Martin-en-Vercors (in French) where there's a good café stop and also a shop selling regional produce. Dotted throughout the Royan Vercors (in French) are a number of villages of interest. St-Jean-en-Royans, once famous for its industry, particularly its manufacture of wooden tableware and textiles, remains the biggest town with a good spread of shops, cafés and restaurants. It's a great location for many of the mountain passes, including Le Combe Laval – Europe's largest gorge and a national heritage site. Another popular village located at the start of Le Gorges des Bourne, is Pont-en-Royans, renowned for its houses that are built into the cliff and look like they are about to topple into the Bourne river below. At the cross roads, take the road signposted Villard de Lans for a breathtaking 14km ascent up the gorge, eventually leading to Villard de Lans and the higher Alps, or take a circular route passing through the villages on the plateaux such as St-Julien-en-Vercors and St-Martin-en-Vercors. Sportives are mass organised events offering you the chance to cycle with lots of other people. The three in the Drome are well organised, with closed or well marshalled roads and attract in the region of 1000 cyclists. You can treat it as a race and be allocated a chip to record your personal time and finish place, or you can simply ride the route at your own pace. The three events are the Challenge Vercors in May, Vercors-Drome in August and La Dromois in September. See our tours section for organised cyclosportive tours. The Vercors generally has warm, sunny springs, hot summers, colourful autumns and cold winters with snow above 500m, but it can also snow much lower down the mountain. If there is no snow or frost, it's possible to cycle on the road all year round, however the season generally starts at the end of April when all the mountain passes have reopened and the snow has retreated. This can be an incredibly picturesque time to cycle in the Vercors when the roads are clear, the skies are often blue and banks of snow reaching up to 6 and 7 ft line the sides of the roads. The season generally runs to the end of October, but it's possible to cycle all the way through to December depending on the weather. Teresa Harte and her husband, Roger Dunne – an ex-International and GB rider – run Velo Vercors, the specialist cycling holiday base in St Jean-en-Royans. 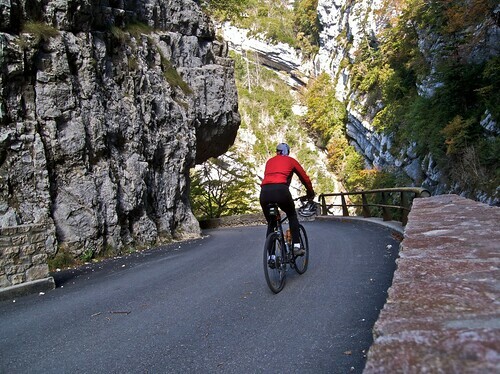 They are passionate about the Vercors and the surrounding region, and are active in encouraging cyclists of all abilities to discover the area by bike. By train from the UK: Eurostar from St Pancras to Valence TGV, changing at Lille or Paris (Lille is easier if you want to avoid changing stations in Paris). Bikes go free if they are packed in a bike bag. For more on travelling by train, see our bikes and trains page for options from other destinations. Car hire and a bus service are available. By bus: The European Bike Express is a safe and reliable way to get you – and your bike – to the area. It has a drop-off point near the Valence TGV station. By plane from the UK, easyJet flies to Grenoble and Lyon; Ryanair flies to Lyon. See our flights to France section for options from other destinations. Zoom into our map below for bike-friendly accommodation across the Alps. You can also browse our links to cycle-friendly accommodation in France here, including hotels, gîtes, B&Bs and campsite options. A choice of hotels, chambre d’Hotes (B&B) and gites are dotted throughout the area with lists available from the following tourist offices: St Jean-en-Royans, St Martin-en-Vercors and Romans-sur-Isere. The regional tourist website has more general tourist information, including accommodation links. It is difficult to hire good quality bikes in the Rhône-Alpes, but Velo Vercors in St Jean-en-Royans have hybrid, road and children's bike hire. La Gelinotte has mountain bike hire in Vassieux-en-Vercors. See also our bike hire listings. Teresa has also written our guide to the Drome region of the Rhône-Alpes.